Salad for breakfast? Why not? This recipe for Blueberry Breakfast Salad is perfect for a flat-belly diet because it incorporates fresh salad greens, fruit, and a bit of crunchy granola. It’s all tied together with a homemade Blueberry Vinaigrette that adds a sweet-savory flavor dimension. Toss the salad greens with 3/4 cup of the Blueberry Vinaigrette. Set aside the remaining dressing. Divide the dressed greens among 4 large plates. 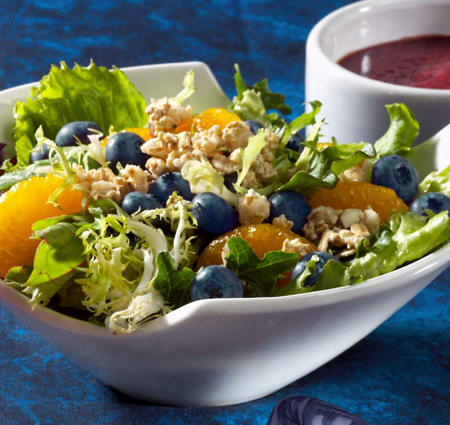 Arrange 1/2 cup of the orange sections and 1/2 cup of the blueberries on top of each salad. Sprinkle each salad with 1/4 cup granola. Drizzle the remaining dressing on top. In a food processor, combine all the ingredients and process until the mixture is smooth. Chill at least 30 minutes to allow the flavors to meld. Per serving: Calories 507 (From Fat 316); Fat 35g (Saturated 5g); Cholesterol 0mg; Sodium 208mg; Carbohydrate 45g (Dietary Fiber 9g); Protein 8g.